Frittata or omelet. Is there a difference? Yes. Does it really matter. No. And certainly, with this Mushroom and Pancetta Frittata you’ll no longer care what it’s called once you’ve scoffed it down. 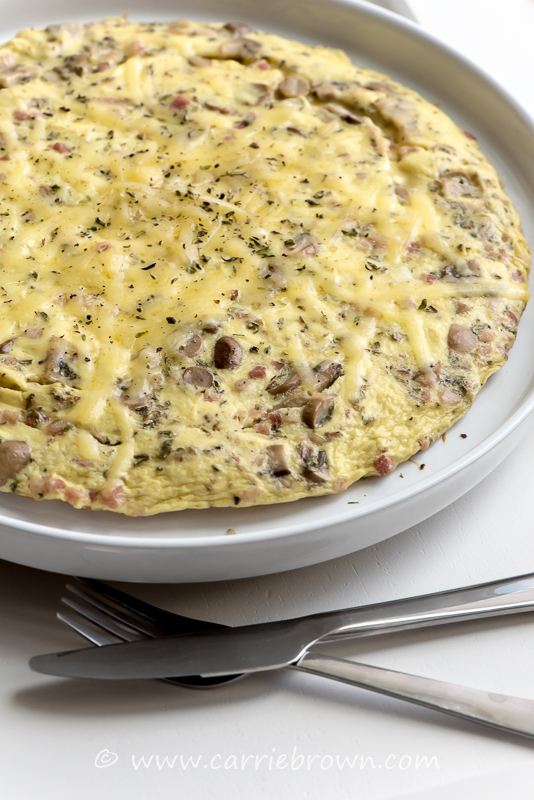 A frittata has the added ingredients cooked into the eggs and is not folded over to be served. An omelet has the added ingredients laid on top of the cooked eggs, and then one half of the omelet folded over to enclose said ingredients. Thus, technically, this is indeed a frittata. A very delicious frittata. 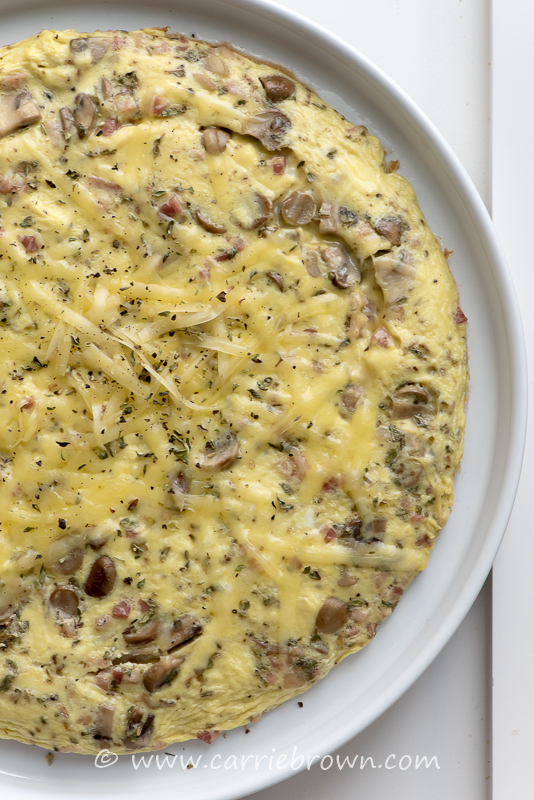 A Mushroom and Pancetta Frittata. Frittatas are awesome because they take minutes to make, have bunches of healthy fat plus a decent dollop of first class protein, and can even be transported and eaten cold hours after they’re cooked and still taste spectacular. 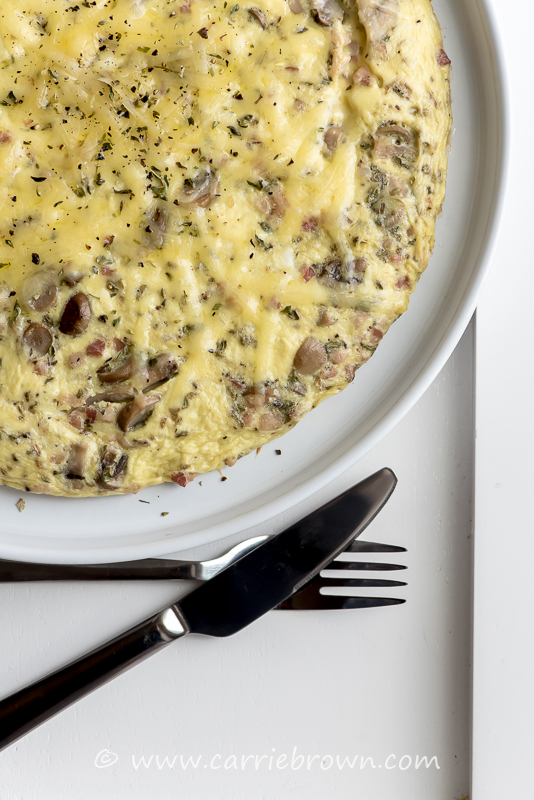 Frittatas and omelets are my go-to meals when I’m tired, or have no time, or both. Actually, they’re often my go-to meals just because they’re so easy and delicious. You can instantly up your frittata game even further by using a different cheese – such as smoked Gouda – to really add an exciting depth to the proceedings. To increase the fat replace 2 TBSP of the water with an extra 2 TBSP of heavy cream. This may be a simple recipe, but that don’t mean this Mushroom and Pancetta Frittata ain’t dang tasty. If you’re new to cooking, frittatas are a great place to start. And if you’ve been around a kitchen a while, this is a good recipe to remind you that often the simple things in life are the best. Sauté the chopped mushrooms and pancetta over a medium heat until the mushrooms are just softened. Turn the broiler (grill) on to heat. Meanwhile, whisk the eggs, cream, water, sea salt and pepper, and oregano in a jug until completely mixed. Pour the egg mixture into the pan over the mushrooms and pancetta and stir for 30 seconds while the eggs start to cook. After 30 seconds, stop stirring and leave to cook for a further 2 minutes. Remove from the heat and place under the broiler (grill) until the top is set and just starting to brown. Remove from under the broiler (grill), sprinkle top with grated Cheddar and slide onto a large plate or serving dish. Slice to serve. For dairy-free: use thick coconut milk instead of cream, and omit the cheese. If you have fresh oregano that you want to use instead of the dried, sprinkle it over the surface of the cooked eggs right before you add the cheese.